Globe Electric's 4 inch Die-Cast Flush Square Trim Recessed Lighting Kit with frosted glass and a matte white finish is the perfect way to brighten up the interior of your home or commerce with style. The frosted glass emits an indirect glow perfect for bright mood lighting. Completely dimmable with a compatible dimmer switch to set the perfect mood and ambiance. Featuring patented PUSH-N-CLICK clips to grip uneven holds and surfaces installation is tool-free and easy. Dimmable with a compatible dimmer switch (not included). Requires one 35-watt halogen or 7-watt LED GU10 bi-pin base MR16 bulb (sold separately). Cut a 3.88-inch hole for this item. Actual decorative trim size is 5.13-inches. TEMPERED FROSTED GLASS: the tempered frosted glass of this recessed light emits a soft indirect glow that is perfect for bathrooms, kitchens and more! The RK29-LED 'Mini Puck Kit'' offer versatility in a compact form while giving a bright punch of light. Installs quickly with the included driver and snap on connectors. Easily adjust the spacing between the three fixtures up to 48 In. apart on a flat surface. Ideal for under-cabinet, shelving, accent lighting and anywhere else task lighting is required. Can be recessed or surface mounted. This is truly made for the ''Do-it-yourselfer''. 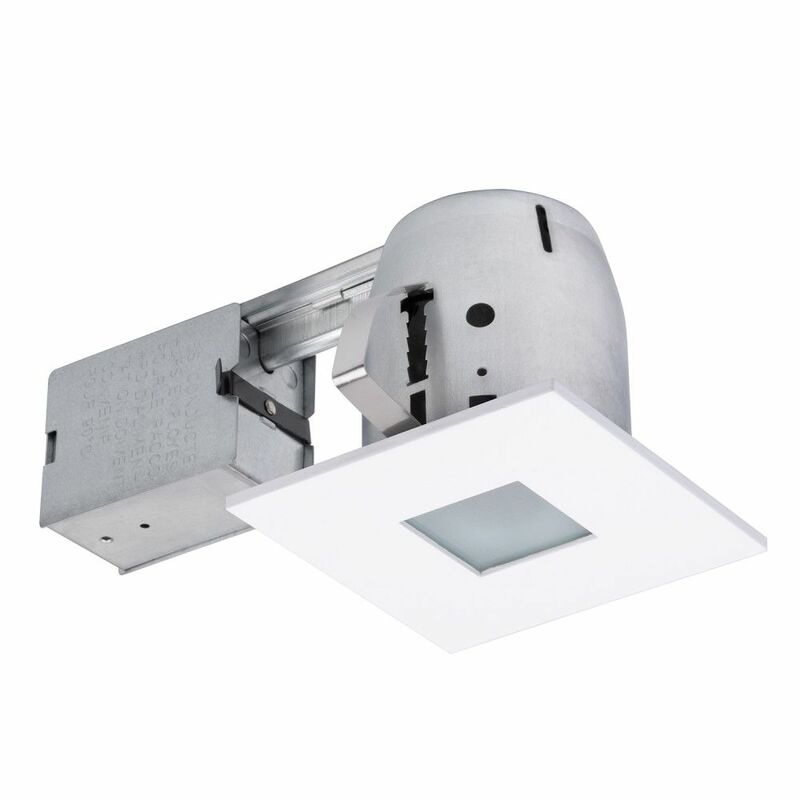 The Commercial Electric Outdoor soffit Lighting Kit comes with (6) 4 inch Non-IC recessed remodel housings, (6) Wet-Location Rated lensed trim, and (6) R20 50W bulbs. The installation hardwares include instruction sheets, Ceiling Panel Coutout Template, and spring clips to mount recessed housings to ceiling panels between 1/8 inch (3.2 mm) to 5/8 inch (15.9 mm) thickness. This is not recommended for soffit panel with thickness below 1/8 inch (3.2 mm). This lighting fixture has built in thremal sensing power shut-off protector. HomeBrite by Feit Electric offers an easy, convenient, and cost-effective way to introduce smart lighting into any home or business. Simply install HomeBrite LED bulbs and download the free HomeBrite app to your phone or tablet to begin controlling and customizing your lights. The HomeBrite App serves as a virtual mobile light switch, which allows you to dim and power lights on and off, set schedules and timers, create scenes, and manage groups. HomeBrites Bluetooth Smart Mesh technology allows the LED bulbs to seamlessly and securely communicate with one another, expanding the range for whole-house control. They use 80% less power than traditional bulbs, making them energy efficient to boot. This energy efficient LED Retrofit kit is compatible with most 5 in. and 6 in. recessed cans. It is easy to install, dimmable and last up to 50,000 hours. Each kit comes with a standard base Adapter and a pre-mounted trim. This Retrofit kit LED is warm white and dimmable via the HomeBrite app. Globe Electric's Slimline Recessed Lighting Kits are the recessed lights of the future. Each fixture is 0.4In (10mm) thick meaning they are ideal for locations where height clearance is limited such as beams or duct work. Energy Star certified and IC rated for direct contact with insulation, they won't overheat, do not require a bulky can and will last for years to come - 50 000 hours or approximately 45 years if used for 3 hours per day to be exact. Wet rated and certified airtight, this 4In kit is perfect for your bathroom, drop ceilings, outdoor soffits and all general lighting applications. 9-coil plastic spring clips sit on top of the housing and are stronger and easier to use than any of our competitor's kits. The frosted lens provides a beautiful soft light that shines with 600 lumens and uses only 9 watts of energy to produce the brightness of a 50W bulb. Single Packs: Need an uneven amount of lights? Check out Globe's single pack 90931. 4 inch Matte White Die-Cast Recessed Lighting Kit Globe Electric's 4 inch Die-Cast Flush Square Trim Recessed Lighting Kit with frosted glass and a matte white finish is the perfect way to brighten up the interior of your home or commerce with style. The frosted glass emits an indirect glow perfect for bright mood lighting. Completely dimmable with a compatible dimmer switch to set the perfect mood and ambiance. Featuring patented PUSH-N-CLICK clips to grip uneven holds and surfaces installation is tool-free and easy. Dimmable with a compatible dimmer switch (not included). Requires one 35-watt halogen or 7-watt LED GU10 bi-pin base MR16 bulb (sold separately). Cut a 3.88-inch hole for this item. Actual decorative trim size is 5.13-inches. 4 inch Matte White Die-Cast Recessed Lighting Kit is rated 4.0 out of 5 by 1. Rated 4 out of 5 by Matthew from Hard to find non-circular trim It's exceedingly difficult to find a canned light with non-circular trim. This one fit the bill and was at a reasonable price. The lens, on the trim piece is very small and when an LED min-flood light is installed, it provides surprisingly little light. It's really hardly more than an accent light. I would have preferred it put out more light and be compatible with a standard bulb base.